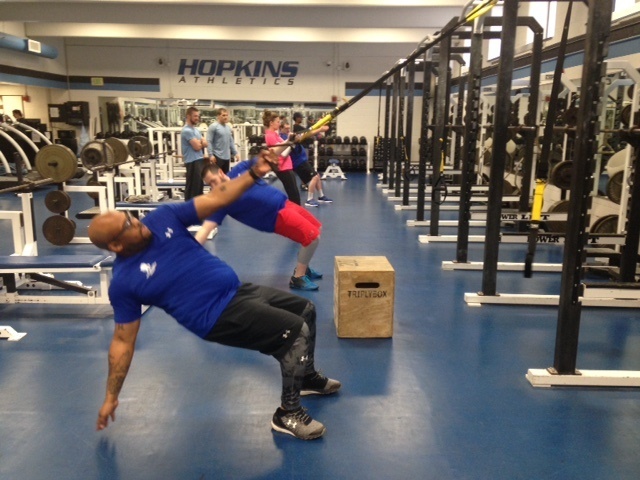 BALTIMORE (Feb. 18, 2017) – Wounded Warrior Project® (WWP) and Johns Hopkins University (JHU) recently hosted a workout and physical health and wellness expo for a group of wounded veterans at the university’s workout facilities. Among the attendees was Army veteran Mark Mills; he served 17 years before being medically discharged. While nutrition is a big component of healthy living, WWP’s physical health and wellness programs also focus on fitness training. WWP frequently hosts a variety of these gatherings across the nation that aid in physical and mental recovery from the invisible wounds of war. In a WWP survey of the injured warriors it serves, more than half of survey respondents (51.7 percent) talked with fellow veterans to address their mental health issues, and 29.6 percent expressed physical activity helps. Warriors participated in a circuit of exercises focusing on different areas of the body at varying levels of intensity. Like other WWP fitness gatherings, the workout was in an environment that accommodates physical injuries and social anxieties. Depending upon the needs and comfort levels of each warrior, WWP staff offered instructions on modifications that improved the workout. Beyond the workout and nutrition coaching, there was another element to the expo that Mark found useful –inspiration. WWP offers programs and services that assist veterans with mental health, physical health and wellness, career and benefits counseling, and connecting with other warriors and their communities.